The difference between organizations that make it in the 21st century and those that don’t will be whether their leaders have learned new skills and adopted a completely new perspective. Leaders will be called on to manage unending transitions, coach and mentor employees and to learn continuously. Donna’s program or keynote gives participants a solid grounding in the basic skills, perspective and knowledge necessary to be successful leaders in the new reality. In this fast-paced keynote presentation, Donna grapples with ideas and strategies that underlie the 21st-century enterprise: the essential characteristics of organizations (AND the personal lives of individuals) that flourish in times of turmoil. Develop a sense of “community” with your peers. Learn your own particular work behavioral style. Learn how each style responds to change and transition in the work setting. Discover strategies for flexing your style in relation to others to decrease tension, increase morale. Learn specific tools to help you with conflict, tension and disagreement. How to hold people accountable and tie to performance evaluations and professional development plans. Learn what to do with those “irregular people” you supervise… and how to know if you’ve really got one! The Seven Deadly Needs and how they interfere with one’s ability to lead. What it really boils down to: the Secret Ingredients of Leadership. Giving Feedback 10:1 ratio of appreciation’s to constructive criticisms. Practice “letting go”, lightening up and loosening up to help you deal with being “stressed to the max” in this wild world we all live in. Customer Service: “How to Service Unto Others as they Want to be Serviced Unto”…meeting the customer where they are, not where you are. A new way to look at “transition”: what change does to people. Also, how to foresee people’s reactions to change and how to design and implement a plan to get people through transition. What to expect, now that the traditional employer-employee contract no longer applies. How to manage endings: taking stock of who is losing what. Plus, dealing with the real issues of loss, anger, fear. The truth about what happens when you fail to manage endings. Use the Pioneer Story as metaphor for continuous change. Managing the transition from an Authority Culture (the old style) to a Communications Culture (the new style). Coaching skills for 21st century leadership: how to help people grow. How to give and receive feedback based on the person’s style. Experience the Circle of Connection. Building a Team: What really matters. How to have Learning Conversations with one another to create Our Future State. Getting comfortable and being uncomfortable. Making decisions in the face of incomplete information. To not take a risk is to risk being ignored. Continuous learning — and unlearning. The Leader as the Chief Unlearning Officer. The Seven Deadly Needs and how they stop us from taking risks. Are you a Quitter, Camper, or Climber? Forget “no fear” — you need the right kind of fear. The power of making bold moves. Living a life of possibility and the heart’s calm guidance. In this four-day leadership development course, you will learn about your own personality style, reading someone else’s and tools for building commitment in tough times. You will learn specific coaching and counseling skills to develop alignment between individual and organizational goals. You’ll also learn why your vision matters more than ever before, why you want to deal with conflicts and tension, why laughter does matter, and why you may want to save your own life. 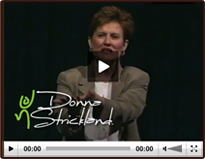 This inspirational, spirit-lifting keynote presentation is ideal for those organizations that find they want to “stick to their knitting.” Donna reminds us that the good moves we don’t make can be as consequential as the bad moves we do make. Playing it safe isn’t always playing it smart. Not in business. Not in life. Getting Free: Change Your Mind, Change Your Life! Interested in Hiring Donna Strickland? Hire Donna Strickland for a training program or keynote presentation by contacting us directly at (303) 808-4880. Download your free article, "Coping with Chaos and Change," when you sign up for Donna’s newsletter! SEO and Web Design by Prime Concepts Group, Inc.
© MMXII Donna Strickland, LLC. All Rights Reserved.